Colored Tubs: Hot New Trend? So lately I've had the little fetish with colored tubs. Probably, because I'll never have one. ha! But nonetheless, I think they are awesome! I've been pinning the ones that I've liked the most, this past month. Cason and I LOVED these huge, freestanding, modern tubs. 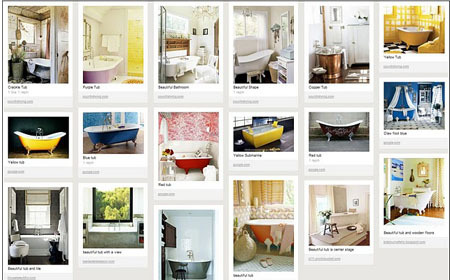 Are colored, over-sized tubs the new hot trend? What's a girl to do if she doesn't have the $$$ or space for one? Paint the outside of her old-school, builder-grade tub? They are lovely, but trendy. I rented a house once that had a pink tub, toilet and shower. I'm sure it was "in" at one time, but just looked awful, later. We once had a light pink one. I'll be talking about it soon. My mom is building a new house and bought a claw foot toub for a steal. It really just needs a coat of paint, and I've been begging her to paint it a color of some sort. It's a cabin type house, so I'm thinking red. For me though, I'd definitely go with a more neutral color. you can totally do it! then post pictures for all of us to see. I love those colored tubs. I don't know why you couldn't paint it. They make paint for almost everything out there these days. I've seen them painted professionally but never done by someone that's not a professional. I say do it and let us all know!!! How fun would that be! Do you think that the builder grade tub would look the same painted? Where would you stop? Because there isn't a lip, like there is on the old fashioned ones. If you can figure it out, I'm all over it myself. 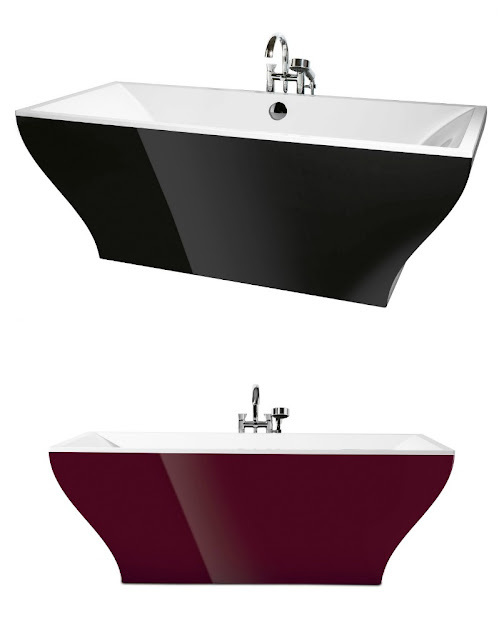 We have two claw foot tubs and the outside of both are painted different shades of red. Everyone loves them! They are AWESOME for taking baths. I didn't know that color tubs were the rage! Ours have been painted before we bought our house 7 years ago! Woa... not liking this trend at ALL. Why lock yourself into a color scheme for life? Probably doesn't help that I have to stare at my inlaws avacado green tub that was all the rage thirty years ago. No thanks! I do like the shape of those last two tubs. oh my gosh! I havent been to your blog in a few weeks-oh man I've missed so much-back tracking now and catching up! and can I just say you are the cutest thing ever!! seriously!! Just curious, what color would you choose to put in your bathroom? I have a tourqoise tub from the 70's. Not by choice,it came with the house. I would love to get rid of it but heck maybe I should hold on to it. Like the painted claw tubs better. How about some.... VINYL!... I did some drinking glasses 2 months ago for a party and they have been through the wash a ton of times and the vinyl is still tight... why not do something with that since I think it might hold up... or a tub monogram.... A TUB-o-Gram! Maddie, who might need to go to bed..a bit punchy! Maybe it is a trend, but history repeats itself-avocado green stoves and maroon toilets anyone?! haha! They were great at one time, but people now RUN from them! I happen to adore the trend-on clawfoots though! While the modern ones are super FUN, they're not my style, and I would freak about resale. However, I say do what YOU love and go for it if you can!!!!!!!!! Oh those are all so pretty! I have always wanted a colored claw foot tub in a bathroom too. I love colored tubs too! I used to live in this apartment with an old caste iron claw tub, the owner painted the outside a light yellow to match the tiles, it was amazing. I loved that bathroom. pretty cool! I would have a turqoise one. wow...love them...I want one in turquoise! !